* The product images are for reference only. Generic equivalents may also be supplied by alternate manufacturers. Our Canadian Pharmacy also carries Albuterol and Combivent Inhaler. How and Where to Buy Advair Diskus Online? Order your Advair Diskus through CanadianPharmacyWorld.com at a discounted price. Our Canadian Pharmacy offers brand and generic medications online with a valid prescription from your doctor. Check out our latest Featured Medications and more. You can place an order through CanadianPharmacyWorld.com or call Customer Service at 1866-485-7979. Are there Alternative Names for the Brand and Generic Advair Diskus? 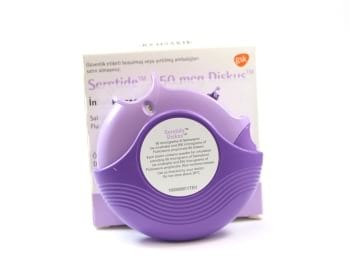 The brand name Advair Diskus from Turkey and India comes under an alternate name of Seretide Accuhaler manufactured by GSK. We may sometimes carry the brand from Canada manufactured by GSK. The generic version of Advair Diskus is currently not available. What Dosages and Forms is Advair Diskus available in? The brand Advair Diskus comes from Turkey and India under the name of Seretide Accuhaler is available in the dosages of 100/50mcg/60dose, 250/50mcg/60dose and 500/50mcg/60dose diskus. The generic Fluticasone/Salmeterol Diskus comes from India under the name of Seroflo and is available in the strength of 100/50mcg/30dose, 250/50mcg/30dose and 500/50mcg/30doses. What is Advair Diskus used for? Advair Diskus (Fluticasone/Salmeterol) belongs to the class of medications known as long-acting beta agonists. This medication is used to prevent asthma attacks. It is used to control and prevent the symptoms of wheezing and shortness of breath that is caused by asthma or ongoing lung disease (COPD). Advair Diskus works by opening airways in the lungs to make it easier to breath. Advair Diskus is used in adults and children who are at least 4 years old. Are there any Precautions and Drug interactions of Advair Diskus? You should not use Advair to treat an asthma attack that has already begun. Do not use Advair Diskus, if you are allergic to Fluticasone or Salmeterol or if you have any other allergies. It is unknown whether Advair is harmful to an unborn baby. Inform your doctor if you are pregnant or plan to become pregnant while you are using this medication. It is unknown whether Fluticasone and Salmeterol pass into breast milk or if it could harm a nursing baby. There may be an interaction between Advair and other medications such as Ritonavir (Norvir) or lopiinavir/ritonavir (Kaletra). Advair Diskus should be stored at room temperature away from heat and direct light. Please do not freeze them. You should not keep this medication inside a car where it could be exposed to extreme heat or cold. Do not keep expired medication.